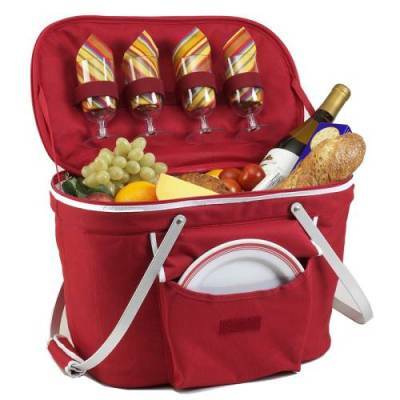 Thermal shield™ insulated picnic basket to keep food and drinks at the perfect temperature for hours. Setting for four people includes plates, glasses, flatware, and napkins. Folds flat for storage and has permanent built in side supports (no installation required) to hold empty cooler upright for easy loading and compact transport after events. Constructed with a lightweight and durable aluminum frame, leak proof food safe lining, zippered lid, front pocket and swivel handles with padded grip. With it's traditional tapered basket shape, it's a stylish way to enjoy dining at any outdoor event.